Graduating on that day were five hundred of us. Everyone was excited to be receiving the degree for which one had burnt the midnight oil and spent the last two years in anticipation of. Parents, friends, spouses were all there to be a part of this important milestone – the graduation ceremony of the Indian Institute of Management, Calcutta. As our friends went on stage, we clapped. But how could one clap for five hundred people? The applause started to fade in the middle of the ceremony. And then a young boy came on stage. Suddenly, the entire hall stood up to celebrate his joy, salute his determination and respect his journey. It was on that day that I met Suresh. It was in that moment that was born the concept of this book. Suresh is among the first few 100% visually impaired person to graduate from the prestigious Indian Institute of Managements, the first one to do so from Calcutta. Every year close to two lakh candidates compete to get into the IIMs. Less than four thousand or so actually make it. It was no ordinary feat thus that a blind boy had not just been able to get admission but was today graduating along with so many ‘abled’ people. The fact that Suresh was amongst us was a moment of learning for me. Till that day, I had looked at a differently-abled person with sympathy. But Suresh’s determination made me feel small of my own thought process. It was not about Suresh’s limitation but my own that I had never looked beyond the disability of a handicapped person, leave aside thinking of his/her bright future. Suresh showed me that if someone really wanted to achieve something in life, he/she will find his way. The more I researched about disability, the more I got to know how wrong I was and the myths I had been carrying so far. Never before had I seen a visually impaired person on the road and felt him worthy of respect? Never before had I imagined a physically or mentally disabled person to have the capability to achieve something extra-ordinary? Never before had I looked beyond a person’s disability and seen him/her as a differently-abled person? As the myths dispelled, came a lot of questions. In a county where 2.1% of our population is disabled, why is it that almost all major public places are still not accessible? Why is it that we still do not see them sitting next to us, in our offices, working hand-in-hand as our colleagues? Why is it that people like Suresh are confined at home, made to curse their destinies and pitied upon? Biases like these have plagued the lives of millions of disabled people in the world. People have looked down upon them. Governments have failed to provide them infrastructural support. Societies have written them off. Fortunately, few such people have managed to rise above all this to conquer the world, to take their destinies in their hands and prove the world wrong. They have proved how disability is not a curse; it is only a different way of living. The book resulted out of my interactions with these people and my sheer appreciation for those who have the guts to take the risk and follow their dreams, despite the roadblocks and negative attitude of the society towards them. 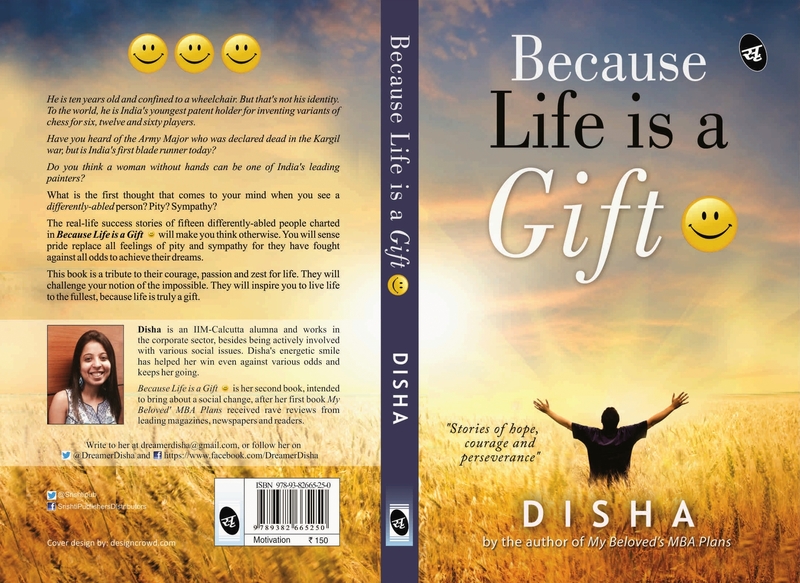 In this book, there are 15 real life stories of differently-abled people, their lives, struggles and victories. At first glance, the book might seem to be relevant only for anyone who is either going through a similar phase in life or has a close friend/relative/family member who is differently-abled. But far from it, the book is as much for all those who have no connection whatsoever to disability. These stories are not just about disability. These are about triumph of spirit, about the power of will power, about the determination of the soul. As you read the book, slow down to not just read the written words but also the angst, struggle, hopes, dreams, strengths of the characters which the stories carry between the lines. Each story carries the message that ‘nothing’ is impossible. Writing this book has made me a better human being. The journey has been enlightening, humbling. I hope the readers too will learn a lot through the people of the book and the book will leave everyone enriched. LIFE IS A GIFT. IT IS UPTO YOU HOW MUCH RESPECT YOU GIVE TO IT.